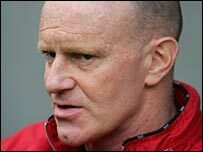 Huddersfield Town have appointed Andy Ritchie as their new manager on a two-year contract. The 46-year-old takes over the League One outfit who are in 16th position in the table. The former Oldham and Barnsley boss takes over from Gerry Murphy who has been in temporary charge since Peter Jackson's dismissal in March. Charlton coach Phil Parkinson was set to be unveiled last week, but he had an 11th-hour change of mind. Ritchie was sacked as boss at Oakwell in November six months after he guided them to promotion. He told the club's website: "There's such massive potential here. "There is no doubt that the club is geared up for promotion to the Championship and that has to be the aim now. "It's now a case of getting the players re-motivated and once we get into the Championship, we can reassess the situation. "I tasted promotion last season and it was a great feeling - now I want to do it again as soon as possible."